After WW I and the signing of the Treaty of Versailles, Cameroon, a German protectorate, was divided into two regions and put under French and British rule. In January 1960, French Cameroon became independent, British Cameroon, 10 months later. In 1972 the two countries united. This monument, dedicated in 1974, is a physical representation of the reunification between French and British Cameroons, representing two serpents whose heads merge and also reflected in the two colors of spiraling concrete. There are two entrances, leading up the staircases, which merge at the top, where there is a lantern, symbolizing liberty. There are four interior pillars and a central pylon, with engravings that describe the experiences of the populations of the five cultural eras of Cameroon. 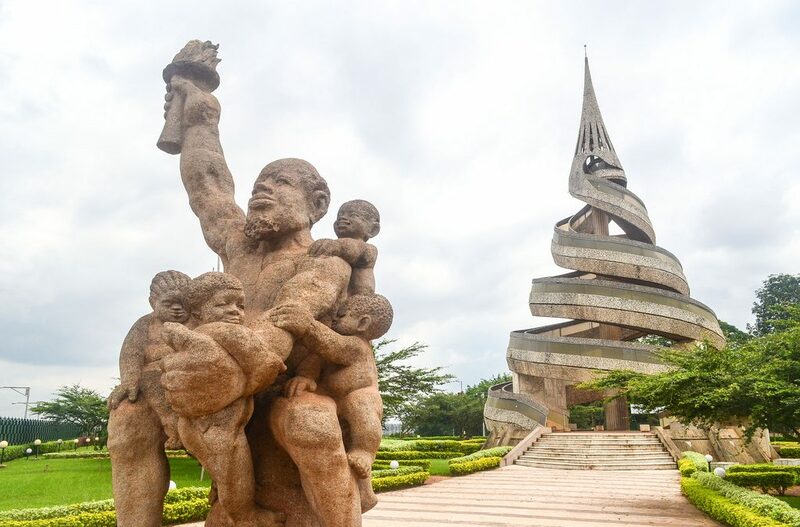 The statue, by Gideon Mpando, depicts an old man carrying five children clutching his body; he is brandishing the national torch, symbol of Liberty. The old man illuminates the path of tradition towards modernity, transmitting the wisdom of the ancestral tradition to the new generations.